It's the time of the month to say Goodbye to December 2016 and this month will without doubt be known for the floods early on in the month. After an exceptional nice November 2016 version, the monsoon hit in full force early in December with day long torrential rain which caused flooding all over the island. Surprisingly all electricity held on and there were not that many black outs, so no baby booms in nine months time. After a week of this torrential rains it calmed down a bit and relatively quickly the flooded roads were drained of water, just to fill up again for a day or two in mid December with another batch of strong rain hitting the island. This has now all passed and most of the run off has disappeared and most roads have dried up again, with a few exceptions. The blog views and hits went through the roof, with over 90,000 page views at this very moment. Plenty of comments and questions were asked and even to this day I receive questions from people being worried about the floods. Although it might be slightly wet New Years Eve party tonight an a couple of light rainy days ahead of us, it's not anywhere near the situation as we experienced around the island earlier this month. 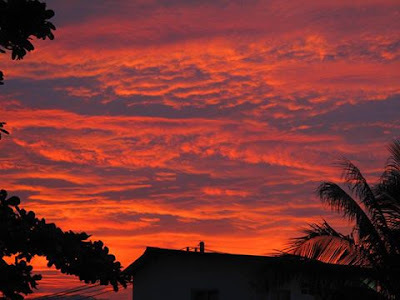 The monsoon is lowly on the way out and sunnier days are ahead of us. It was a busy month for work for me, with a PADI IDC finishing on Phuket and another starting on Koh Phangan. Now I will be home for about three weeks in total before I hit the road again fr the first PADI IDC program in 2017, and I will be off to Phuket again. A review of my diving year 2016 has already been posted, for a link, click here. Enjoy the New Year celebrities and see you all next year! The forecast is looking rather nice, at least a lot better than originally predicted. Rain is forecast for the next four days, but not a lot and this is accompanied by strong winds. Come Tuesday, the weather should improve and it might get a lot sunnier, drier and the wind has settled down. Midnight might actually be dry tonight. Enjoy the new years festivities! The forecast keeps improving slightly, each day we get nearer to that predicted depression. It's windy all right, a fierce wind is blowing and should stay here until a couple of days after new year, but the expected amount of rain is a lot less each day. It should rain on and off over the next five days but not anywhere near the originally predicted torrential rains that were predicted just a few days ago. New Years Eve at midnight might actually be dry now although the Thai government has prohibited any fireworks out of respect for the mourning of King Bhumibol. The forecast is slightly changing for the better. The rain is still supposed to be coming down over the next couple of days, but not as hard as originally predicted, that's currently pushed back to later next week but there's still some strong wind predicted. It's well worth keeping an eye on these developments, it could go either way, ease up or get worse again but we still may see a wet New Years Eve nonetheless. The forecast for the next seven days is not looking that great. As of tomorrow we may have plenty of short showers coming along with a wet Friday in sight as well, when the wind is picking up and come New Years Eve it's supposed to have strong wind and quite a bit of rain, but not as much as previously was predicted, so there is hope that it may slow down a bit. The first couple of days in the new year are supposed to be windy and accompanied by a bit of rain. The forecast hasn't changed much. Nice and partially cloudy and possibly sunny until Thursday. On Wednesday the wind slowly starts to pick up and come Friday the rain joins the equation. Friday night and over the weekend we may see storm like wind conditions with lots of rain to accompany the wind. There will be a very wet New Years Eve brewing up, all over Southern Thailand. It's Boxing Day, Tsunami now twelve years ago when so many people perished after a 9.1 magnitude earthquake that set off the Indian Ocean tsunami. Centered off the west coast of Indonesia's Sumatra island, it was the world's third-largest earthquake since 1900. 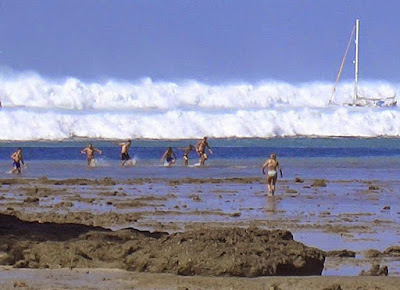 Approximately 230.000 have estimated to have been killed by this tsunami. The number of countries where people died in the tsunami. Indonesia suffered the most deaths (167,540), followed by Sri Lanka (35,322), India (16,269), Thailand (8,212), Somalia (289), Maldives (108), Malaysia (75), Myanmar (61) and Tanzania (13). Two each died in Bangladesh, Seychelles, South Africa and Yemen, and one died in Kenya. A sad day to remember. RIP to all those that passed away. An update; around 8.30am the cloud cover broke open and we now can enjoy a partially cloudy sky with plenty of sunshine. The forecast for the next seven days is not looking that great anymore, up until Thursday it's partially cloudy with an occasional shower but from the 30th onward the wind and rain is supposed to pick up with storm like conditions and non stop rain on the 31st December and 1st January. Not an ideal weather condition for a New Years Eve and at this moment I wonder how fireworks will be possible to be set off, due to the expected wet circumstances. This weather depression is hitting pretty much all of Southern Thailand, including the Andaman Ocean side with Phuket having incredible amounts of rain predicted at midnight on New Years Eve at the moment, enough to flood all of Patong for a few hours. It's good to be back home again and I started the day with a 30km run, hence the late update. The forecast is looking great for the next week. However, come Friday the wind starts to pick up and the year is about to end in a storm with heavy wind and plenty of rain and as it looks, easily carrying this weather over into the new year. It seems all of Southern Thailand will be caught in this storm spell. Enjoy the next couple of sunny days, laced with an occasional shower. All PADI specialty instructor training has been completed and an update will appear later in within a few hours I will be on the ferry back home to Koh Samui. 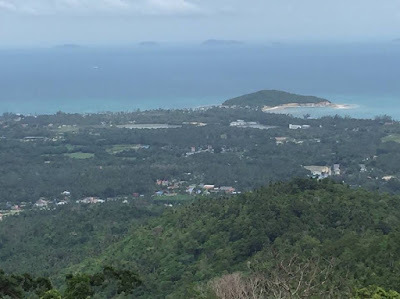 A sunnier Koh Samui is emerging again after a pretty harsh monsoon period with a few serious flooding problems earlier this month. This doesn't mean the monsoon is completely over yet, but we're heading in a much drier and sunnier direction, little by little and very slowly! This picture is from mid December, showing that we also had a few nice and sunny days during the monsoon period. The forecast for the next seven days is looking good with plenty of partially clouded skies and thus also sunny skies ahead of us. Wednesday may see some rain but come Friday 29th December, the wind may be picking up with storm like conditions on the 30th and 31st and plenty of rain. Let's hope that this changes soon enough and the current nice weather patch continues into the new year. Today is the last day pf PADI Specialty Instructor training and once more we go to Sail Rock, third day in a row. The forecast remained fairly unchanged with mostly partially cloudy skies for the next seven days but be prepared to have some rain showers here and there, but also some sunshine. The monsoon season seems to be walking on it's last legs and hopefully we will have sunny days back soon. 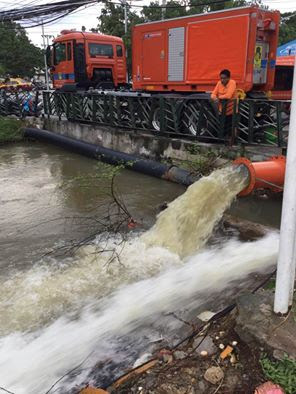 Water run off at the walking street bridge in Chaweng. Still plenty of run off from hills and other kinds of water that need be taken care of. 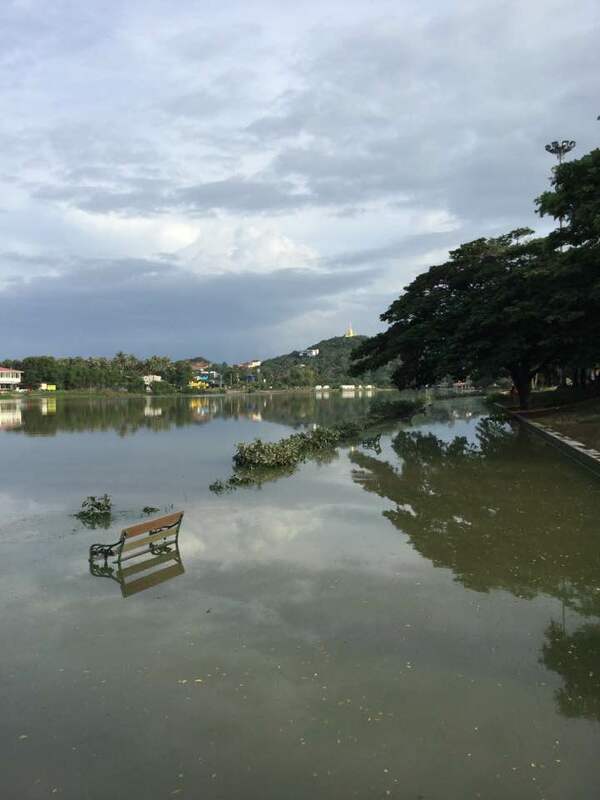 Everything is back to normal though and these are the last reminders of the recent floods Koh Samui had to endure. The beach front of Chaloklum on Koh Phangan as seen from the dive boat upon returning from a dive trip to Sail Rock yesterday. The forecast for the next seven days is looking good, a slight increase and possibly some rain tomorrow but after that partially clouded skies and no rain predicted until shortly before new year a few showers are expected. A lot can change weather wise in a positive way during this time frame, but this is looking good! Enjoy a sunny holiday season! The PADI IE (Instructor exam) for my candidates went very well yesterday and all three of them passed the exams successfully and are now brand new PADI Open Water Scuba Instructors! 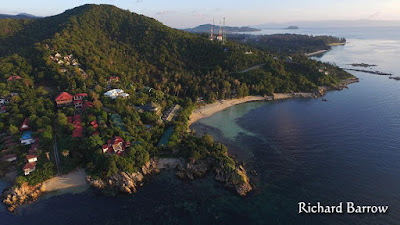 For the next three days I will be on the boat to Sail Rock, for PADI specialty instructor training. 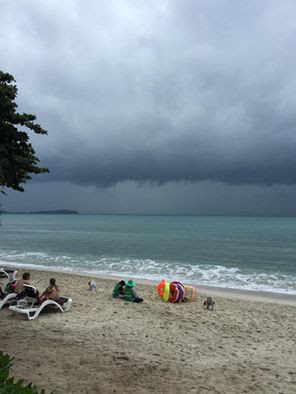 A very dark sky is looming over Chaweng beach yesterday morning in front of the Centara Grand Beach Resort and sure enough there were plenty of rain showers during the day time, mostly during the morning, the afternoon saw less rain. The 7-11 in Haad Yao on Koh Phangan protects the entrance to the shop with sandbags, a very common sight during the rainy season, to keep the excessive water outside. The obligatory dog is enjoying it! The forecast changed again and the nice weather predicted yesterday, has gone walkabout and has been replaced with a forecast more clouds and more rain until Friday. After Friday it should remain mostly cloudy but less rain is expected. At Haad Yao on Koh Phangan we currently have a shower pouring down but the rain seems to come and go, this is the third shower this morning, in-between dry spells. Current temp at 9am is 25C. This morning sees a later update because I just got back from a long morning run, 21.41km in just under two hours or a 5'35 pace, which I'm very pleased with since there are a lot of hills on the route. The PADI IDC candidates are in the middle of their last PADI IE presentation (the instructor exam), the open water dive at Haad Yao reef. 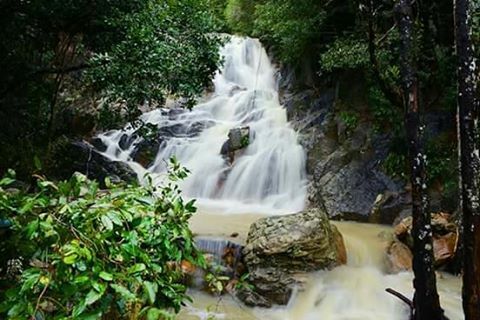 The Namuang waterfall at Baan Namuang is at it's best, this is at good as it gets if you want to see the waterfall in it's fullest glory. A very strong and steady downfall in the water basin below the fall which is filled to the rim. The water isn't exactly clean and you can't swim in the basin right now, it would be too dangerous but it's a very spectacular view! 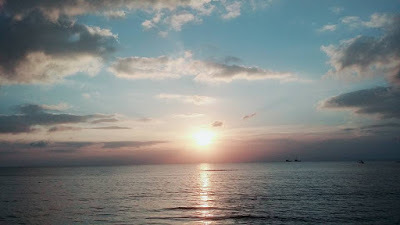 The forecast predicts a lot nicer weather after today's rain, partially cloudy skies with possibly a fair amount of sunshine and possibly just some rain come Thursday afternoon and Friday morning, the wind should drop as well, allowing all diving and snorkeling trios to be enjoyable. Contact me if you're interest in either one of them! All courses have been finished yesterday, including the EFR Instructor course for December 2016 and today the PADI IE (Instructor Exam) is about to start within an hour in Chaloklom, the Northern part of Koh Phangan, for our three PADI IDC candidates. Sunset yesterday on the Norther shores of Koh Samui. It was a lovely partially cloudy day with plenty of sunshine and no rain. This was near Bang Po. 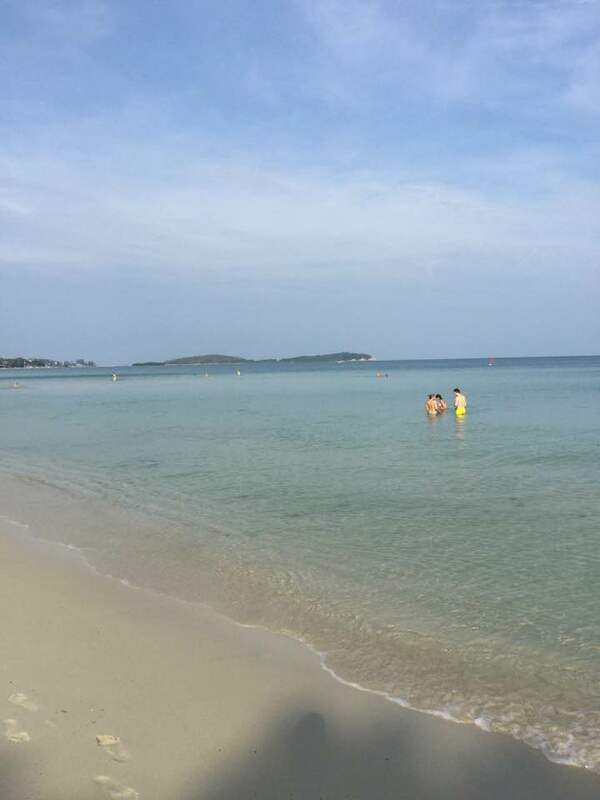 Haad Yao beach on Koh Phangan yesterday during the afternoon, nice and partially cloudy with plenty of sunshine during the day yesterday. The forecast for the next seven days after tomorrow. Tomorrow there should be heavy cloud cover and plenty of rain, not hard, but steady. As of Wednesday it is looking very nice, partially cloudy skies and mostly dry days with possibly a few sunbeams. A dry Christmas seems to be in the making. 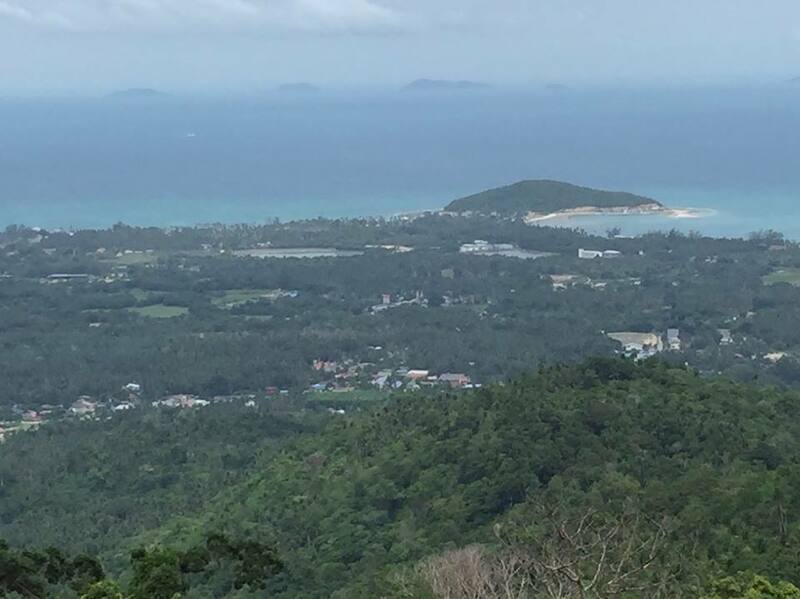 It's mostly cloudy around Koh Samui this morning but against all odds there are also big blue patches in the sky and it's dry again. Plenty of rain is predicted until around noon. Just after noon time the wind is supposed to drop as well. Current temp at 7am is 27C, a massive difference to the previous few days. The current December PADI IDC on Koh Phangan came to an end yesterday and today we wrap up some loose ends and complete the EFR Instructor course with the PADI IE (the instructor exams) starting tomorrow. Yesterday saw plenty of rains and floods again around Koh Samui. 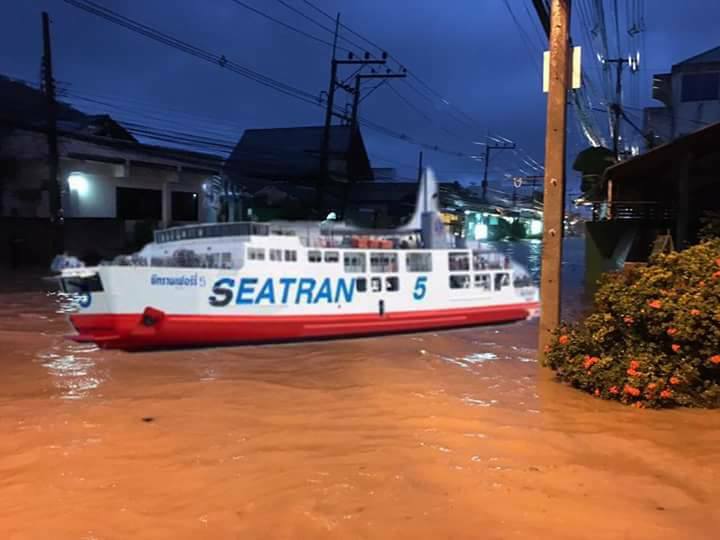 After all night and all day rain, many roads flooded again although by afternoon at many places the water receded, despite the non stop rain. The rain wasn't torrential but steady. Many places around the island suffered this time from power cuts and ere all day long without electricity. In my room on Koh Phangan I had to wrap a towel around my feet to get them warm! Fisherman's boats hiding out at Thong Sala harbor on Koh Phangan, two days ago, for the predicted bad weather patch. About an hour after I took this picture, the rain started to come down. The forecast is not looking too bad. There should be plenty of rain this morning and although it's cloudy, the sun is shining through some blue holes in the cloudy sky. Today the wind should start dropping again during the afternoon and tomorrow and especially Tuesday should see rain again. From there on it seems very likely according to the forecast that the clouds will go away and we may have sunny moments again with little to no rain on most days. At the moment, Christmas looks dry and the sun may be out. The forecast predicts plenty of rain today with some stronger than usual wind, for tomorrow there should be more rain during the morning but during the afternoon it should get dry again with the rest of the week partial cloud cover with possibly some sunshine thrown in at times. The monsoon isn't over yet but slowly an end is getting in sight. At this moment Christmas may be cloudy but dry, although that can change over the course of next week, so keep an eye out on the daily updates here. On Koh Phangan we have grey clouds all over the place, from dark to light grey and it just started to rain some ten minutes ago but it also seemed to have stopped again. Current temp is 25C at 7am and we don't expect any sunshine here but hopefully we don't have all day long rain either, like yesterday. Hin Ta and Hin Yai in Lamai yesterday, with a very dark back ground, clouds in all kind of grey to almost black shades. 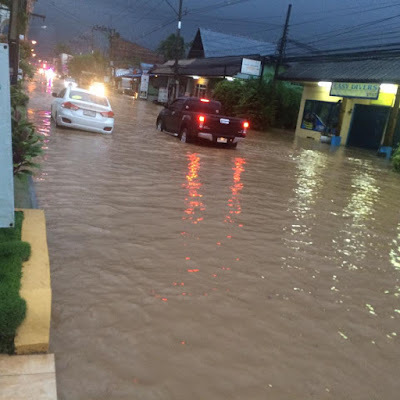 There's was plenty of rain around Koh Samui yesterday but not all day long. The rain wasn't hard or torrential but a nice steady downpour to a drizzle at times. Outside of the classroom of the current December PADI IDC on Koh Phangan at Haad Chao Phao yesterday, with the rain having a ball. All day long we had rain, not hard but almost non stop all day long, As a result we had some minor floods on some parts of the road, but because the rain wasn't hard, the floods weren't too bad. We were in the swimming pool yesterday for almost two hours as part of the PADI IDC training and it was cold! The forecast predicts a slight increase in wind over the weekend with all day long rain, again, not torrential but steady. Come Monday it should clear up and we may see some sunshine again. The monsoon is back, but this time in a lot more reasonable way and how you can expect a monsoon to be, without the excessive and torrential rain and all it brings with it. The roads are fine, most or all floods are gone and the drainage system can handle showers like last night. The current PADI IDC on Koh Phangan has reached the halfway mark here and we're making good progress. The forecast is looking good, a lot better than usually can be expected this time of the year, when the monsoon should be in full swing. We had our extreme floods earlier this month, now we have extreme good weather, so enjoy! This coming weekend may see some stronger wind and rain, possibly all day long or most of the day but not as torrential like we recently had but after the weekend it might really clear up and a very sunny and warm lead up to Christmas is likely! Yesterday we visited my favorite restaurant on the island, an Italian restaurant in Chaloklam by the name of 'Caffe della Mocca'. View towards Big Buddha from the Seatran pier. The water is still very murky but the weather is looking good again! The floods have now mostly gone around the island and although there's still water coming down from the mountains, the run off is starting to slow down as well. Little by little. A view from the resort where we use the pool during the current December PADI IDC on Koh Phangan. 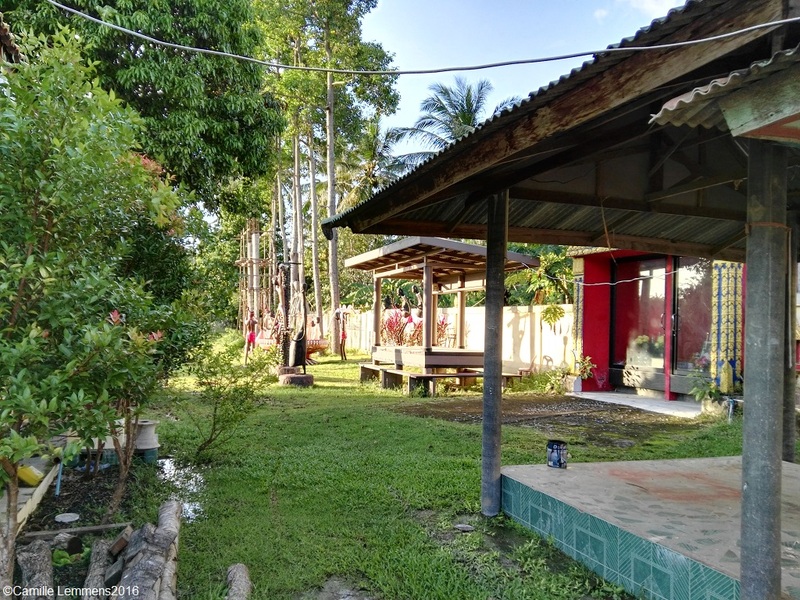 It's located on top of a hill between Haad Yao and Haad Salad and some spectacular views over the ocean. 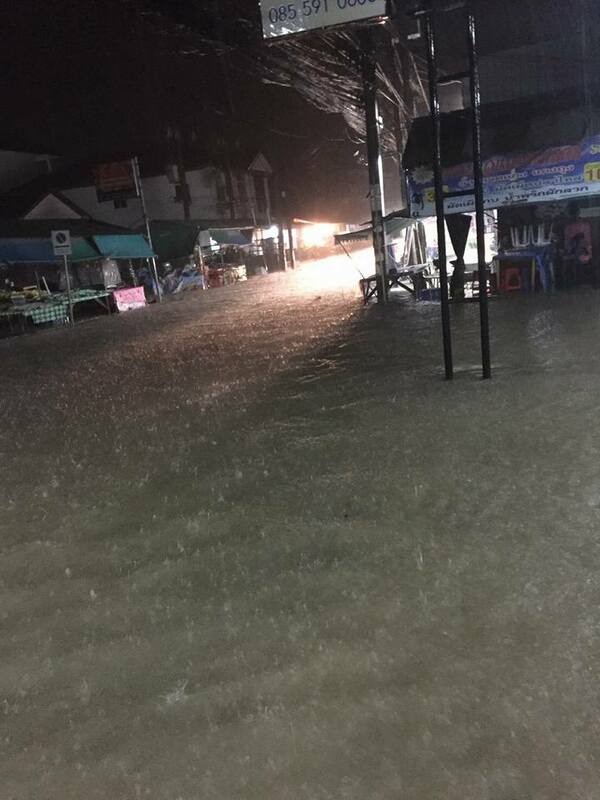 Also on Koh Phangan the floods and puddles on the roads are almost gone and the run off water from the mountans is slowing down. The forecast is looking very good. No major rain periods are predicted for the next ten days but occasionally you may expect a short shower. This is nothing unusual for this time of the year since it's the monsoon season after all. The sun should be out and about as well, so enjoy this, this is rather unusual for this time of the year, it's the monsoon season after all! Come Saturday, the wind may pick up but Sunday the wind should slow down again. 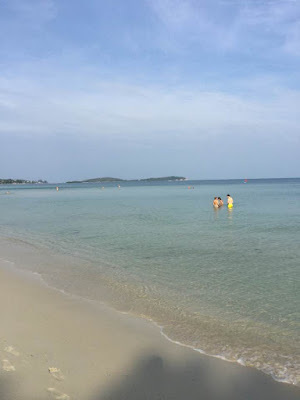 Enjoy this mild December weather, you may even be able to enjoy the beaches around Koh Samui, just be careful and watch the red warning flags on the most popular beaches in the North (Maenam and Bophud) and East side of the island (Chawng and Lamai), if red flags are up, do stay out of the water! 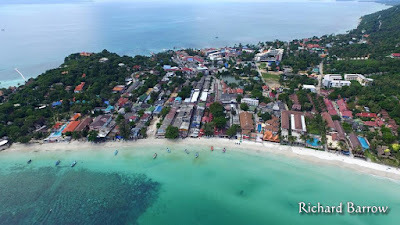 Another picture by Thailands best known blogger, Richard Barrow, from his visit last year to Koh Phangan. This is what I see each day between where I stay and where I teach the current PADI IDC on Koh Phangan. This between Haad Yao which is on the left and Haad Chao Phao which is to the right. You can also see a bit of the road. in these hills, where I run at the moment every day around 11km. Very hard and steep hills indeed, which were part of the cancelled Full Moon Marathon due King Bhumibol's death. The forecast for the next ten days has changed a bit again and for the better. The bad weather patch for coming weekend has disappeared, it will still be cloudy and windy but the forecasted rain is not heavy anymore but more like a series of manageable showers throughout the day. Enjoy the mild December that's coming our way, well deserved after the recent torrential rain and floods. Today is a compensation day for 'Constitution Day' which was celebrated last Saturday. This means that all banks, schools and governments buildings and the like will be closed today. A 'bank holiday' as the English would call it. 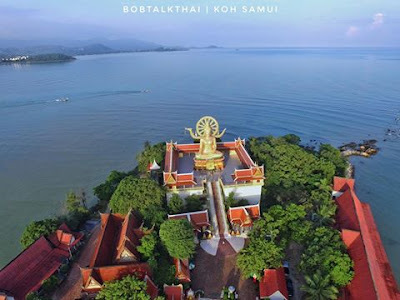 Beautiful drone picture of Big Buddha during the recent lovely weather. Flat oceans, partially blue skies and no rain (ok then, just a little bit sometimes)! 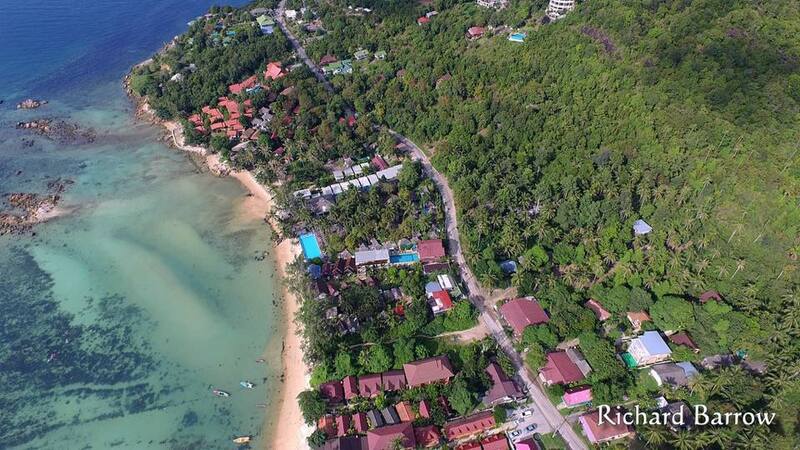 A lovely drone shot of Haad Chao Phao on Koh Phangan, where I currently am teach the PADI IDC for December 2016 on Koh Phangan. This picture is exactly from one year ago, when Thailands best known travel blogger Richard Barrow visited Koh Phangan. The forecast is looking good, all that hard rain seems now to really have disappeared. Do expect rain showers though, but not strong and most likely not too long. Next weekend the wind may pick up a bit and there may be some more rain, like a good all day long rain shower. We will wait and see how this pans out though, hopefully it will weaken before the next weekend hits us. This more like you can expect during the monsoon, without the massive amounts of torrential rain we had during the the first December week and it's accompanying floods. The current PADI IDC on Koh Phangan and PADI IDC Staff courses are in full swing here. Between Haad Chao Phao and Haad Yao on Koh Phangan yesterday. A lovely sunny afternoon sky and calm waters. The forecast ahs changed a bit again and the previously predicted strong rain and wind for next weeks Thursday and Friday are back again, after they disappeared off teh screen in yesterdays foreast. We will have to see how this pans out and if it will be really that much rain coming down by the end end of next week. 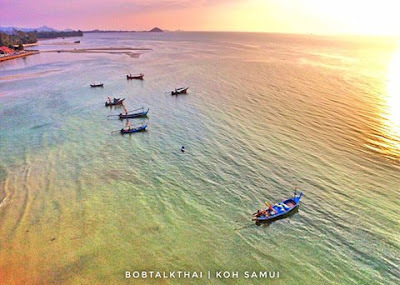 For the time being however, enjoy the unexpected sunny days around Koh Samui.